1 Bring a small pan of water to the boil, lower in the egg and cook for 8 minutes. Cool under cold water, then peel and cut into quarters. Meanwhile, toss the prawns with the cream and most of the dill, then season. Toast the rye. 2 Toss the shallot in the dressing in a large bowl, and let it mellow for a few minutes. Chop 100g watercress and add it to the dressing with the whole watercress leaves and toss to coat. 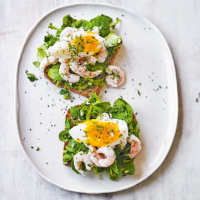 Mound some of the salad on top of the toast, spoon the prawns on top and finish with the egg and a little more dill. Crack some black pepper and sea salt over the egg to serve. Eat with any remaining salad on the side.